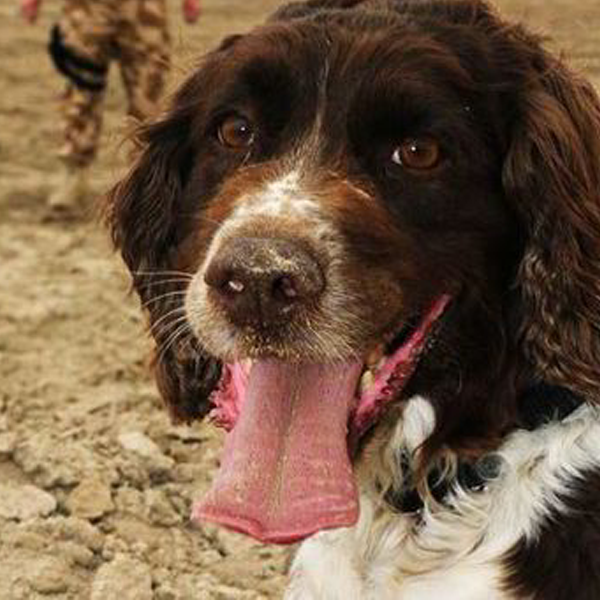 Buster is a Royal Air Force Police Arms and Explosives Search Dog. 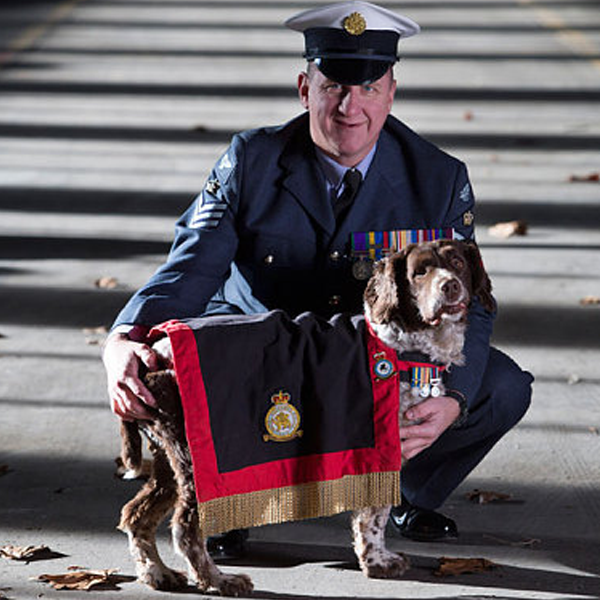 RAF Police mascot – lifetime honour. He completed five tours of duty to Bosnia, Iraq and Afghanistan in his career and was the last Military Working Dog to leave Iraq. Buster, an English Springer Spaniel, arrived at the Defence Animal Centre in Melton Mowbray in 2003 to train as an Arms and Explosives Search dog. During his career as a Military Working Dog with the RAF Police Buster is credited with saving a thousand lives, both military and civilian. From his first day in training, the stocky liver-and-white spaniel showed signs of excellence. Nothing the trainers set before him was too much of a challenge, which made Buster the dog everyone had tagged for greatness. On graduation he was teamed with Corporal (later Sergeant) Nick Lyons and posted to HMS Caledonia, the Royal Navy base in Rosyth, assigned to the RAF Special Investigations Branch. Between 2006-07, Buster was deployed to Bosnia Herzegovina for the first of two tours where his expertise as an AES dog was in high demand locating illegally held weapons and explosives. This put him in a good position to be chosen for his next assignment – Afghanistan. Flight Sergeant Michael “Will” Barrow heard how a dog called Buster was making a name for himself within the RAF Police dog unit and so when he was looking for an AES dog to join him on a special Operation in Afghanistan he was pleased to hear from Nick Lyons who offered-up Buster as the best dog for the job. Nick was very fond of Buster, so it was a tough call, but he knew Buster was the top dog. The partnership of Buster and Will Barrow was one of those rare and special relationships. The bond between the man and dog translated into an exceptional friendship and successful work record. During their time in Afghanistan Buster was attached to several regiments including A Company 2nd Battalion the Mercian regiment, the Viking Troop Royal Marines and the Coldstream Guards. 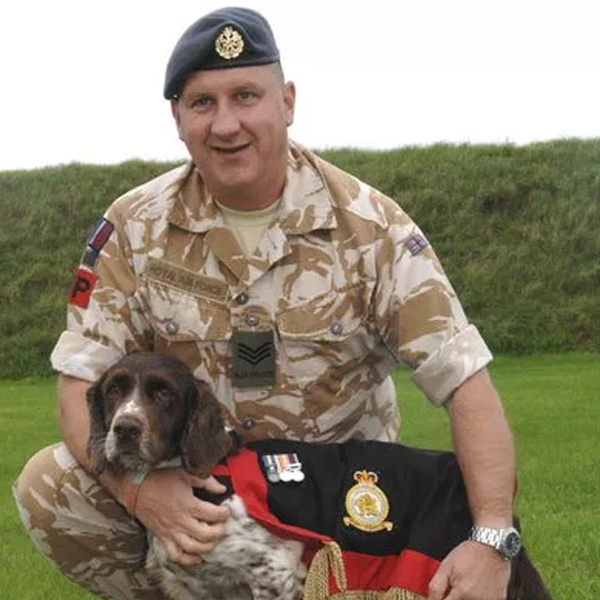 Buster had also impressed the US Forces with his abilities as a search dog and as a valuable colleague in the ‘other’ battle – to win the hearts and minds of the local people. Buster made friends because he was a dog for all people and especially children. Buster’s prowess as an AES dog saved many lives. Always working ahead of the ground troops, he cleared a safe passage detecting any weapons, hidden explosives and deadly IEDs (Improvised Explosive Devices) set by the Taliban to cause maximum harm to military personnel and civilians. Deployed to Kabul and many locations within Helmand Province Buster adapted to the heat, the cold and the dust to carry out his duties in what was then one of the most dangerous places in the world. He patrolled the length and breadth of rolling poppy fields, conducted checkpoint duties and vehicle searches and spent days and nights in the desert searching for and locating hidden cashes of ammunition, weapons and explosives before they could do harm. Buster was also instrumental in the apprehension of insurgents including the arrest of two suicide bombers. Alongside Will, he carried out his duties in the shadow of terror and uncertainty. Returning to Iraq as part of Operation Telic in March 2009, Buster provided safe passage for the many convoys to Kuwait in support of the UK drawdown. As befitting a war dog with his record, he had the honour of being the last UK Military Working Dog to leave Iraq. After an action-packed career, Buster came home in March 2010 ready to run-down to his retirement in 2011. From the moment Will met him off the Hercules at RAF Lyneham, Buster became a target for the world’s media. Television appearances on BBC’s The One Show and BBC Breakfast programme combined with a multitude of radio interviews and press articles. Buster, the war dog was home. Always a crazy tail-wagging, bustle of muscle Buster rarely sat still, but when he did come to standstill, he always displayed a natural military bearing. 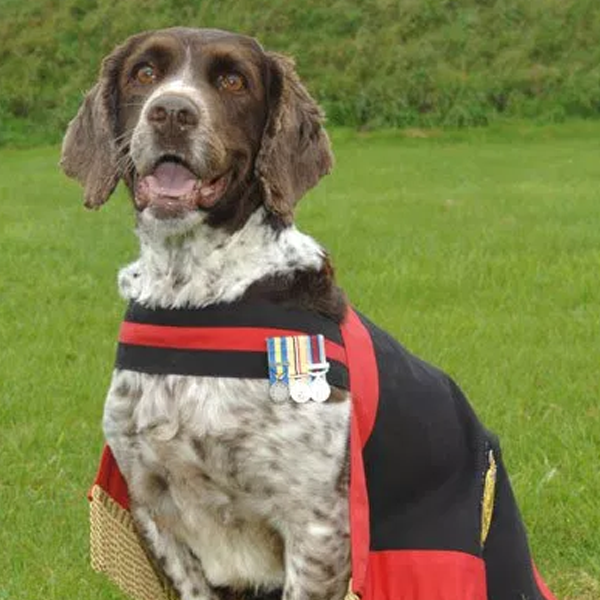 His many honours included the lifetime position of RAF Police Mascot which came with a specially made red and black coat for ceremonial occasions and special dispensation from the Military Medals Office to wear his five campaign medals in public. Appearances included the Remembrance Day parade at the National Memorial Arboretum in Staffordshire where Will and Buster joined colleagues to honour the fallen. Honours rolled-in to recognise the brave Air Dog, from within the Service, including the RAF Police Tosh Thomas Memorial Trophy and the title of Best Military Dog Team from the Worshipful Company of Security Professionals. Buster was always a glittering Ambassador for the RAF and his cool confidence in any situation was present in battle and on the media stage. 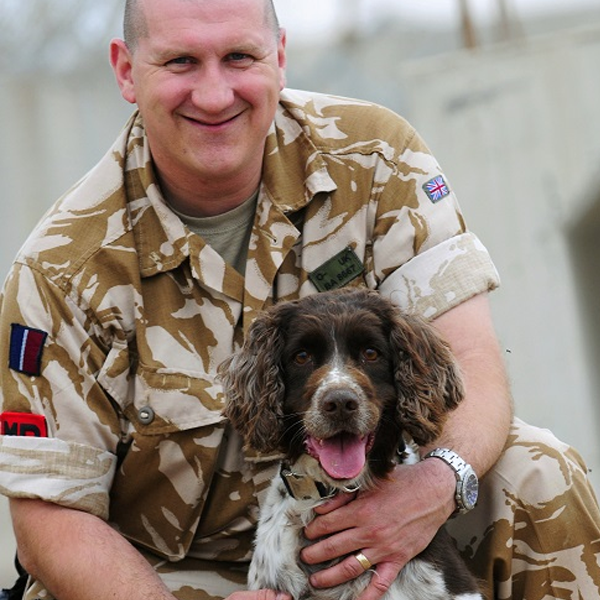 A nomination for the Sun ‘Millies’ Most Outstanding Airman award was a great honour and as winners of the Crufts Friends for Life Award 2012, Will and Buster brought the house down with a standing ovation on the final night of the show at the NEC in Birmingham. Stardom suited Buster just as well as the military. 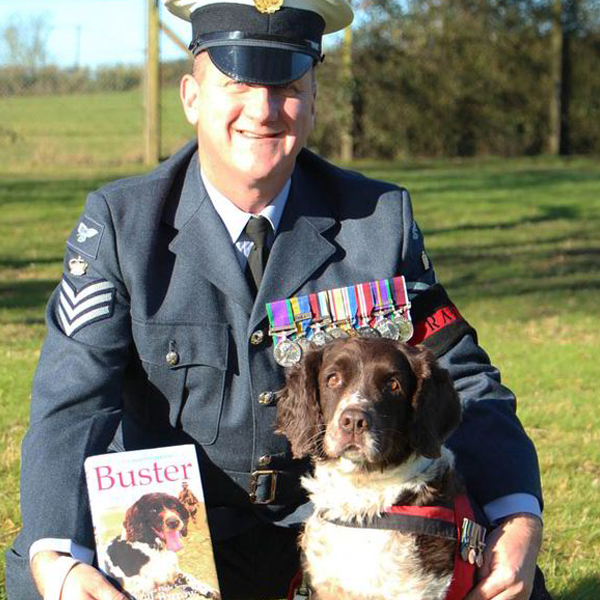 As a war hero and loveable Springer Spaniel Buster helped raise thousands of pounds for charity. He continued to do this well into his retirement and always with Will at his side. Buster passed away at Will’s home in Lincolnshire on 16 July 2015 – Will was with him to the end. He will be remembered by all his RAF Police colleagues as a loyal and faithful ‘Snowdrop’ who had a profound sense of devotion and mischief in equal measure.